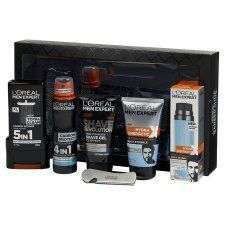 Lots of other half price gift sets in store and possibly online. Good as a gift, not particularly good value if bought separately, as when on offer most of these are £1.49 (but when not on offer it's a great package). Odd how they do a shave gel when the 5 in 1 shower gel is supposed to be a shave gel too (BTW it is pretty good as a shaving gel too). Good as a gift, not particularly good value if bought separately, as when …Good as a gift, not particularly good value if bought separately, as when on offer most of these are £1.49 (but when not on offer it's a great package).Odd how they do a shave gel when the 5 in 1 shower gel is supposed to be a shave gel too (BTW it is pretty good as a shaving gel too). Some are 1.49 on offer that's true but not the face wash or moisturiser. The moisturiser alone is 12.99 in boots. Cheapest I've ever seen it was about 4.99 in Tesco. Now you're making me want to buy it! Available for me, just checked. I've posted a few of these and used them and they are generally pretty decent, though I only buy them on special (which seems to be literally all the time for some reason).